Here at 3cubed we often get asked can our GoldMine software integrate with our PABX phone system? The answer is absolutely. GoldMine CRM can integrate to your phone system using a CTI product called CyDesk. CyDesk is software that connects to your PABX phone system and GoldMine CRM. It gets the two systems talking to each other using a technology called TAPI. As long as your phone system is TAPI compliant, then connecting it to your GoldMine software should be easy. The GoldMine CTI system will triple the number of calls logged into GoldMine because it will automatically display a complete a call window whenever a GoldMine user makes a call and when they receive a call. Hence every call they complete will be logged inside GoldMine. CyDesk allows GoldMine users to simply double click a GoldMine phone number to dial it. Saving you time and wrong numbers. Once you’ve double clicked on the required phone number, CyDesk will initiate a call with your phone system and then POP a complete a call window in GoldMine. When an incoming call is detected for a User, CyDesk will pop the GoldMine contact record instantly. At this stage, your phone is ringing, but you can very quickly review open Cases, Pending activities and the like so you can be prepared to answer your client’s questions. Once you answer the call GoldMine CRM will prompt you to log a call. 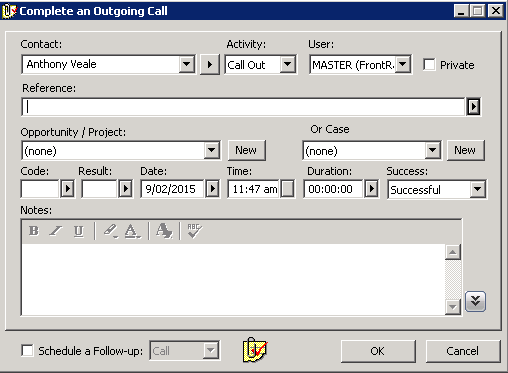 Logging incoming calls and outgoing calls into GoldMine CRM has never been easier. CyDesk also has an add on product called CyRecord. 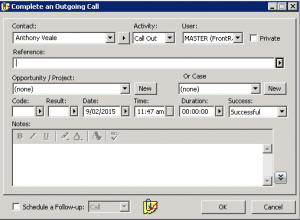 CyRecord allows you to record phone calls and add a link to the recording directly in your GoldMine call window. Perfect when you need to prove exactly what was said or not said. This requires a PABX phone system with a 3rd party TAPI driver. For more information on CyDesk and CyRecord, simply give us a call on 1300 32 82 33. Tagged: CTI, goldmine, PABX, Phone.